Why should you call SERVPRO? Because we are highly trained, licensed, insured professionals that take our line of work seriously. We are trained to understand the situations we are faced with when remediation is needed. Whether it is bio-hazard substances, mold, dirty water, debris, etc., we do our best to clean, contain, and keep our employees and your family safe from harmful interactions. How's the Hot Water Heater Room? 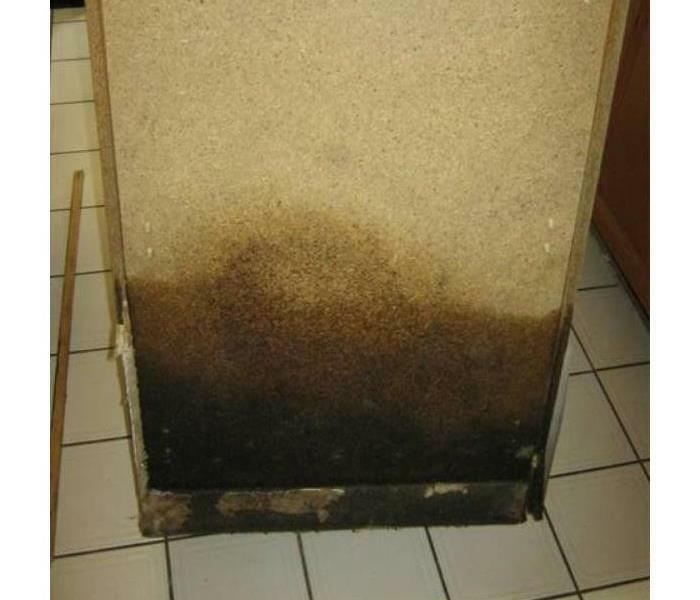 Utility rooms in commercial building complexes should be inspect for the detection of mold. 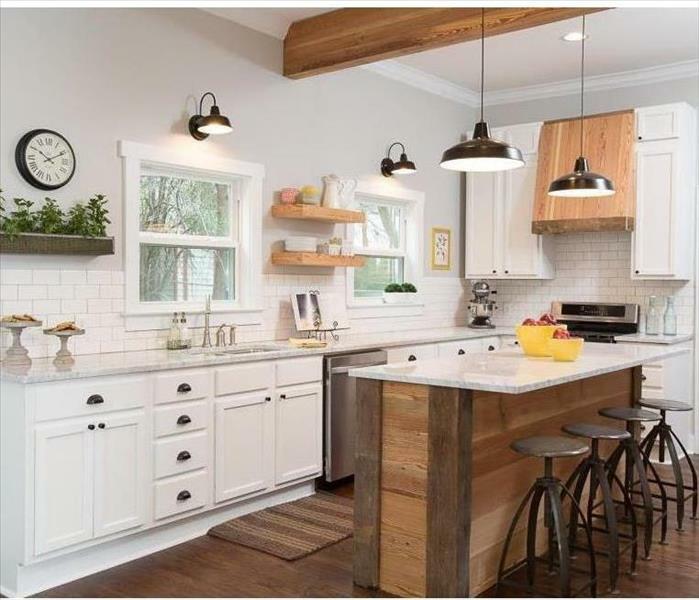 Utility rooms tend to be hot and humid and a perfect breeding ground for mold. Call in your SERVPRO team from Burke-Clifton-Fairfax Station to check your buildings for mold. We can be reached 24/7 on (703) 250-6300. 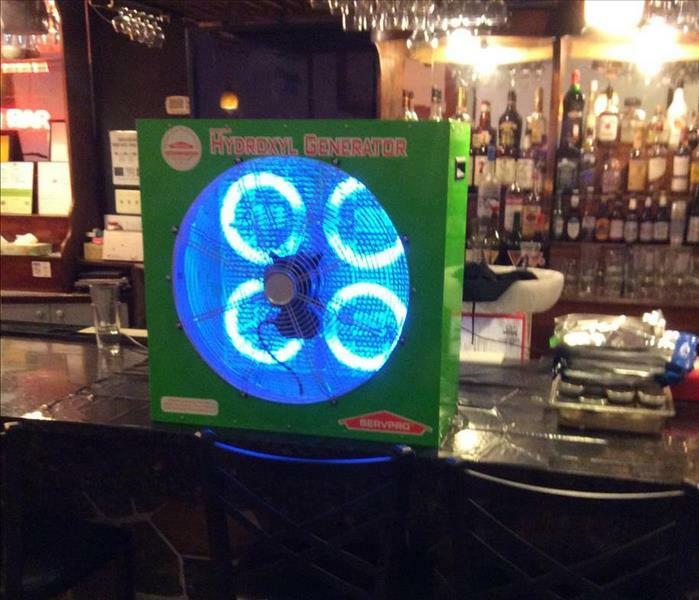 If you have water damage in your commercial establishment, whether it is an inn, restaurant, office building, apartment, etc., call your local SERVPRO professionals at SERVPRO Burke-Clifton-Fairfax Station for your water remediation needs. We're fast to respond and will get you up and running again in no time. Call us on (703) 250-6300 anytime 24/7. Fire is not the only thing that destroys and makes a mess.....smoke is right along behind it, wreaking havoc along the way. If you have fire and smoke damage, call SERVPRO of Burke-Clifton-Fairfax Station 24/7 on (703) 250-6300. We're fire and smoke remediation specialists and can help you rid the havoc! Kitchen Fire Got You Bummed? 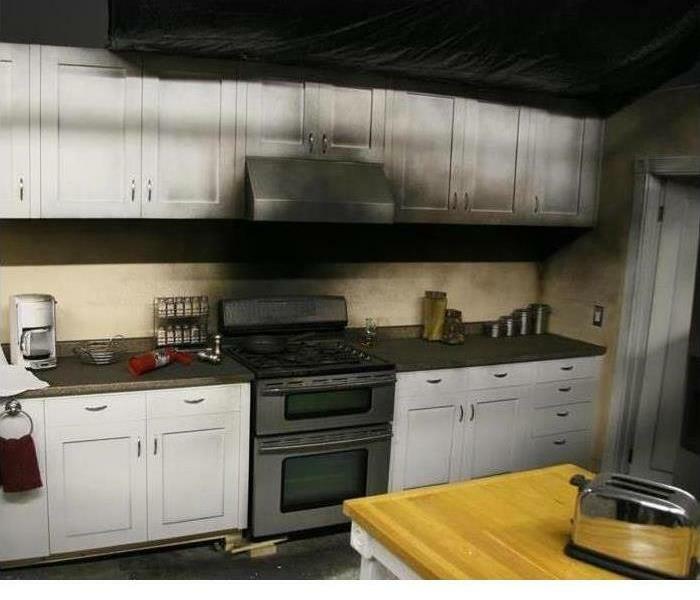 If you have experienced the unfortunate event of a kitchen fire, don't be despondent, call the Fire Remediation Specialists at SERVPRO Burke-Clifton-Fairfax Station for all your remediation needs. We are fire specialist and can get you back to normal in no time. Please reach us 24/7 on (703) 250-6300. 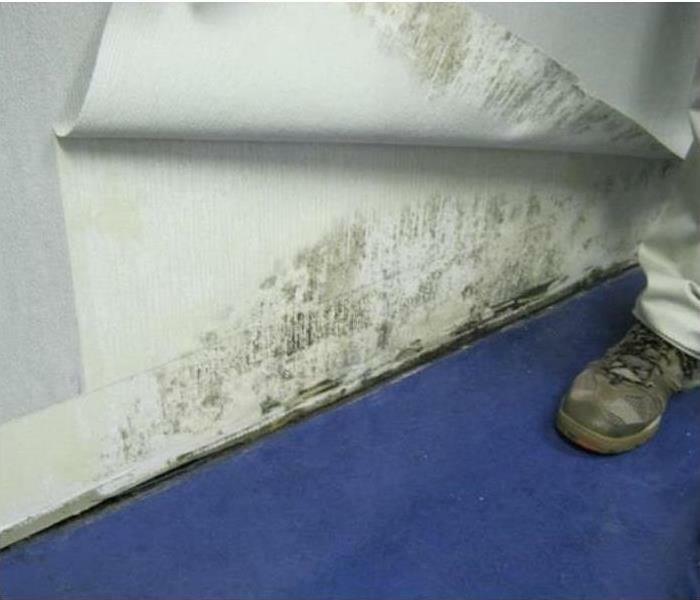 If you cannot get your carpet to smell fresh and clean, you may have mold underneath in the padding and on the floor. Call SERVPRO of Burke-Clifton-Fairfax Station 24/7 on (703) 250-6300 and let us check things out for you! 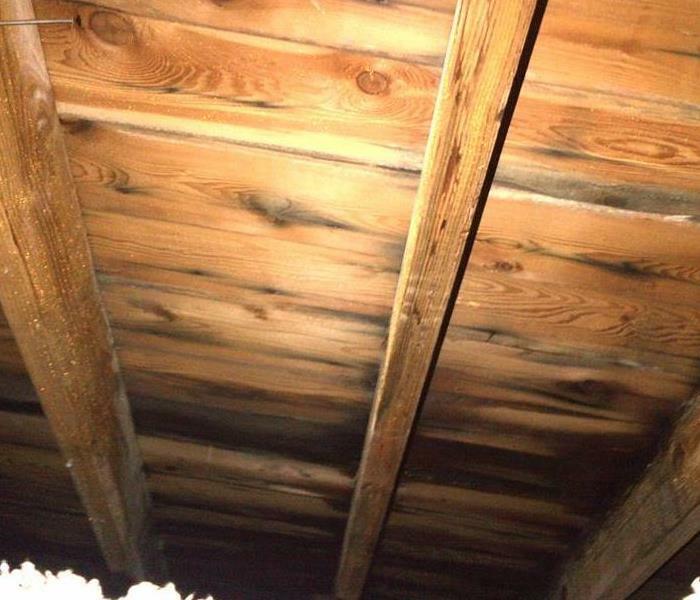 When was the last time you checked your attic for mold? Let the professionals from SERVPRO Burke-Clifton-Fairfax Station take a look. We can be reached 24/7 on (703) 250-6300. Has a Storm Left You Wet and in the Dark? If a storm has thrown your life upside down and you don't know where to start with all the water, call SERVPRO. Your professionals at SERVPRO Burke-Clifton-Fairfax Station can be reached 24/7 0n (703) 250-6300. 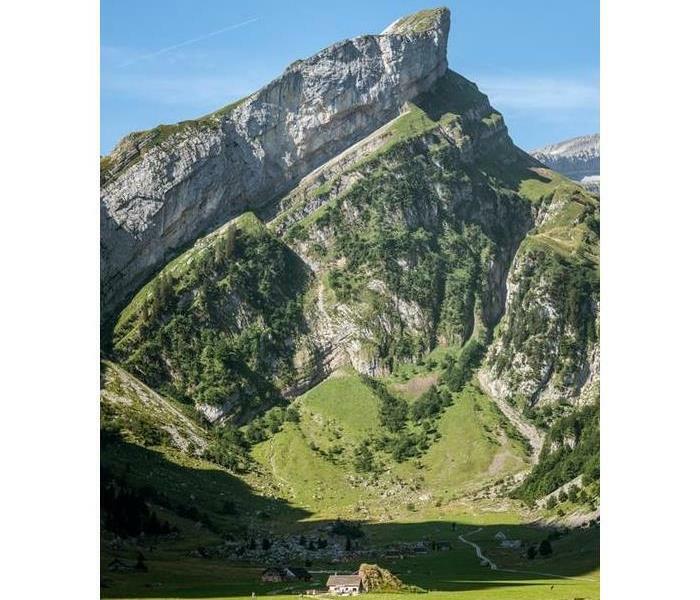 Let us put you right-side up again! 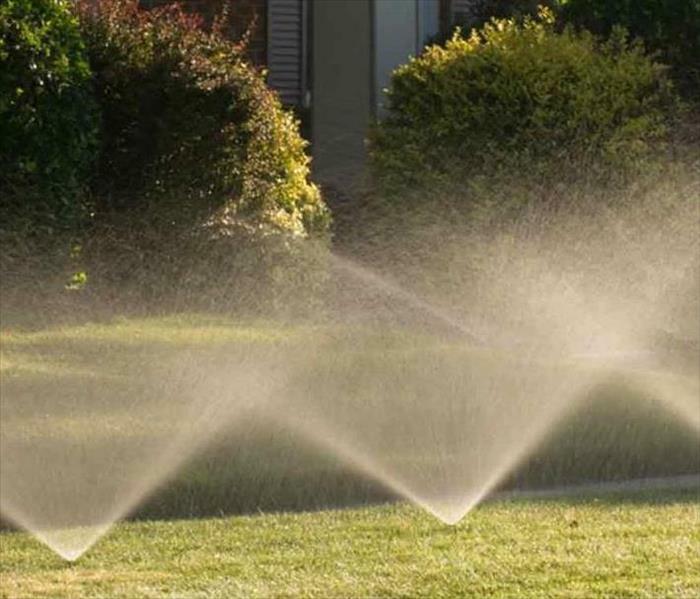 If your sprinkler system leaks into your home, call the professionals at Burke-Clifton-Fairfax Station for your water remediation needs. We can be reached 24/7 on (703) 250-6300. 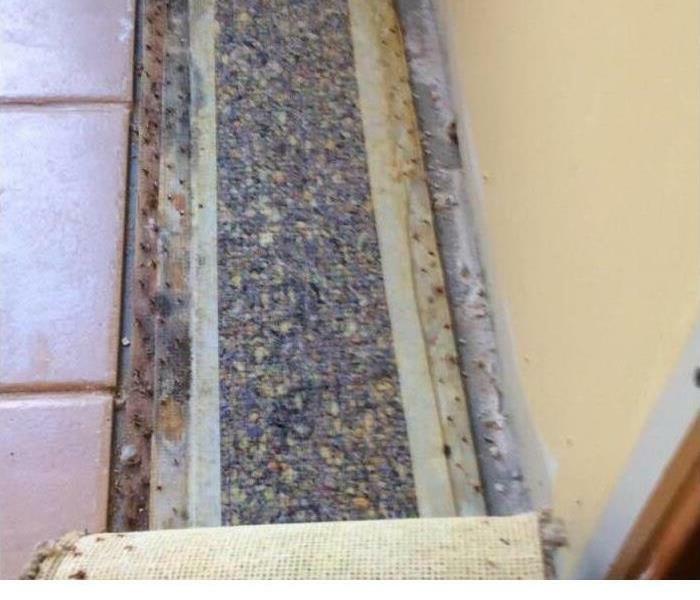 Many times we walk in to a water disaster and the homeowner can not figure out how the water got from over there where the source was to the other side of the room or house where it ended up. 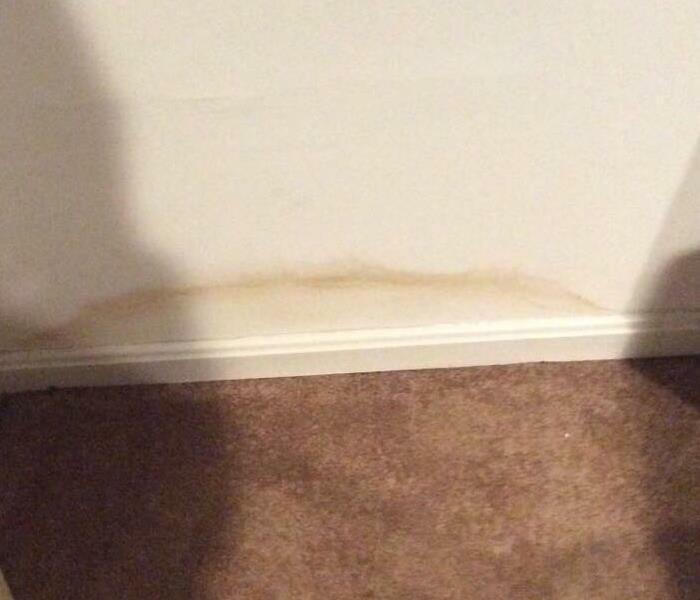 Active water leaking can follow a slope on ductwork, joists, subfloor joints and end up just about anywhere. Many times water floods downstairs from a source upstairs. When that's the case, we have to get to the joists and the subfloor that support the floor above. 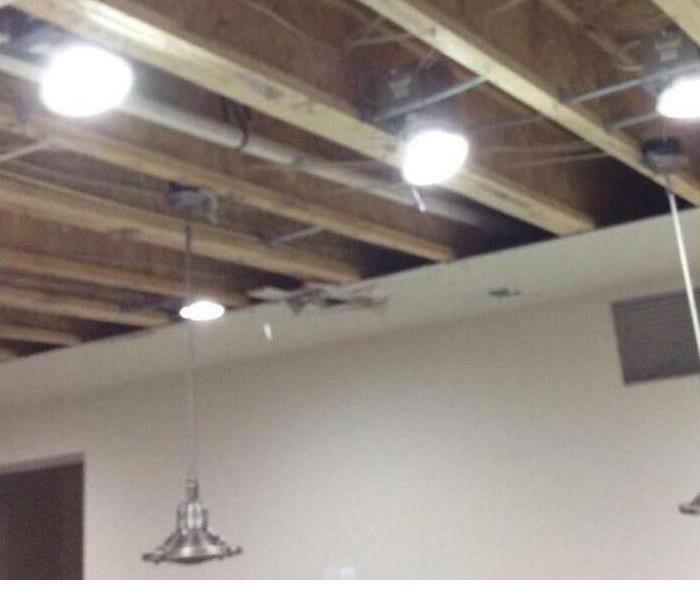 We remove drywall and then use air movers that are designed to shoot air at the wet structural materials above. When you have a water disaster, call SERVPRO of Burke-Clifton-Fairfax Station at 703-250-6300. We're available 24 hours/day, 365 days/year. 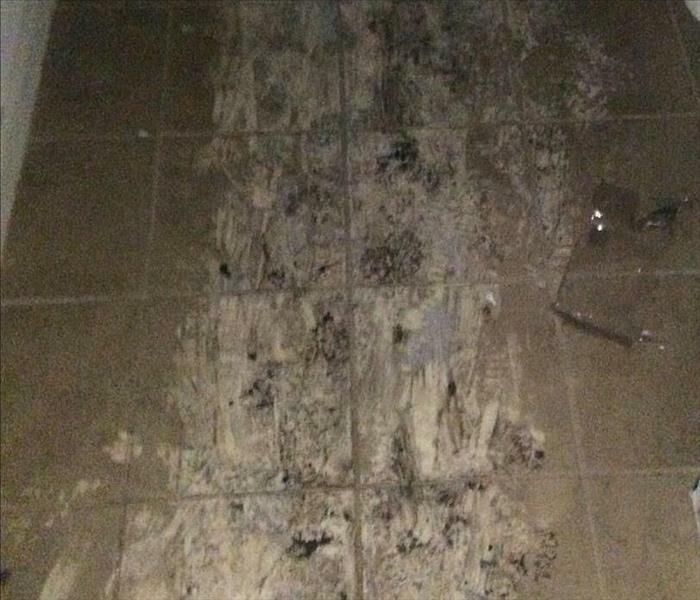 Wood floors can be ruined if they get wet. 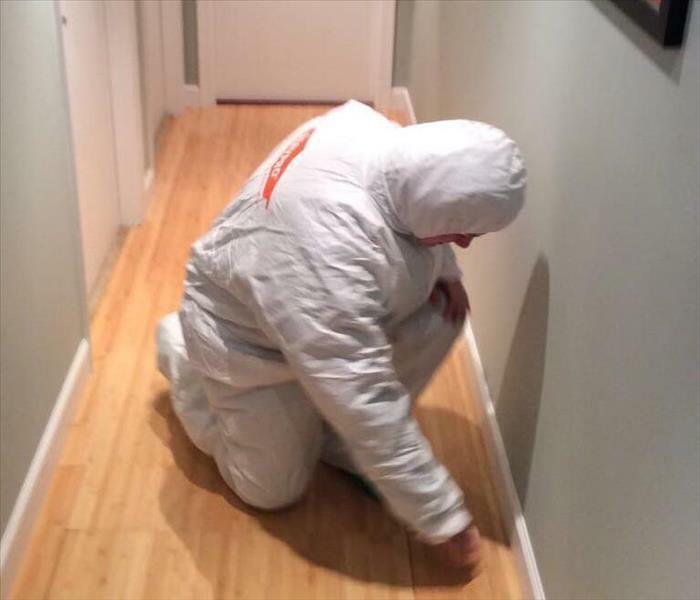 In this case, a freshwater toilet overflow caused a problem but we were able to save the floors. 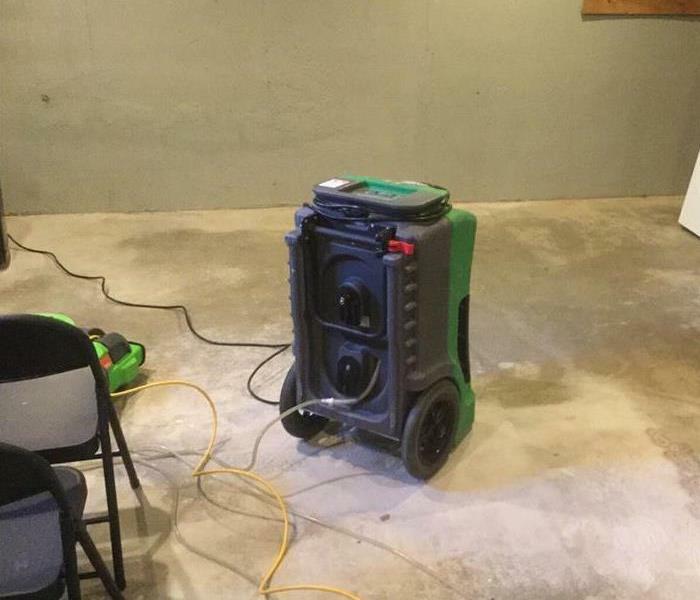 Specialized drying equipment allow us to dry wood out quickly and avoid the messy business of matching up new floors to existing. Call SERVPRO of Burke-Clifton-Fairfax Station at 703-250-6300. We saw a number of cases where basement slabs got wet during a storm but there was no apparent place the water got in. 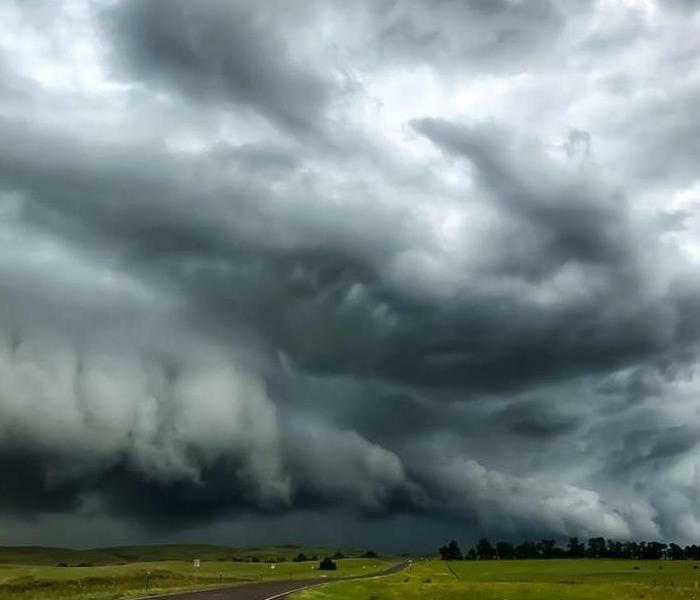 When we get a hard rain from a storm, it may be on top of oversaturated ground. Water pressure can build up under the slab if the sump pump is not working or can't keep up. That water under the slab has a way of coming up through tiny cracks and holes in the cement. 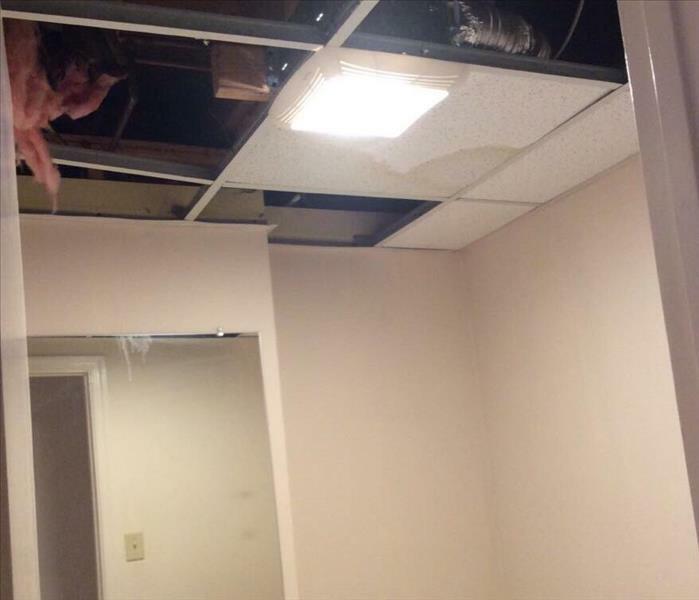 In this last storm, we were called out to an office building where one of the bathrooms on the top floor got flooded when the building lost it's roof shingles overhead. It does not take much for water to find it's way in during a storm and it's a good idea to do a thorough inspection afterwards. Each Spring and Fall, if you're a homeowner with a sump pump you should do an inspection. If there is any debris in the crock, clean it out and then double check the pump works. When storms strike- we often clean up flood water as a result of sump pump issues. Here's a photo of a kitchen cabinet that was against a wall that was below ground level. The homeowner had an issue with their sprinkler system where the foundation wall behind the cabinet was taking on water. 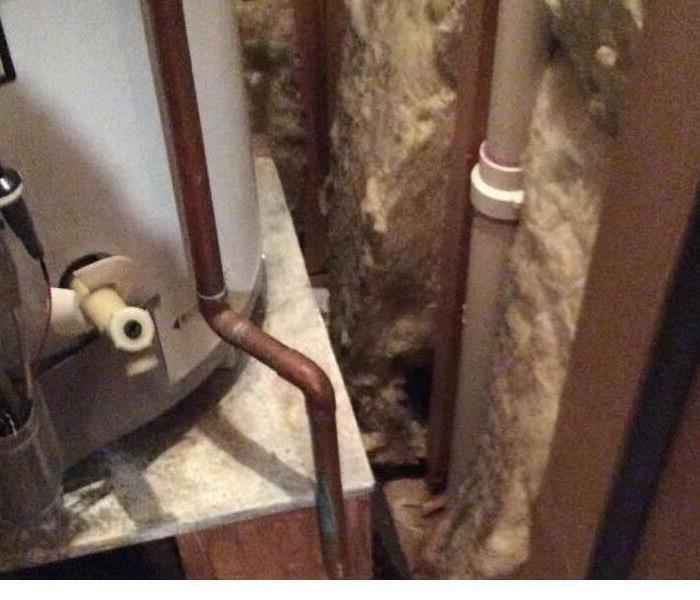 The homeowner did not see the problem at first- they smelled the problem at first. 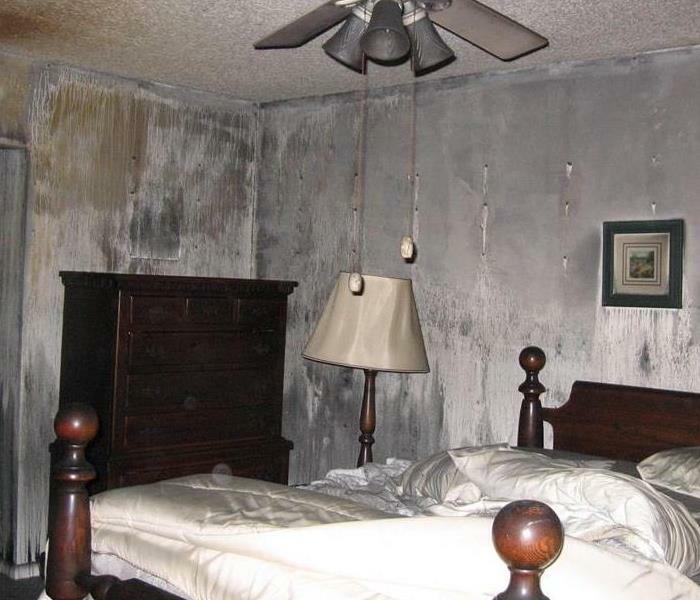 Mold needs 3 things to grow: 1) spores, 2) food, 3) water. In Northern Virginia we have high spore counts outside most of the year so good luck keeping them out of your home. Also, homes are made of organic things that are food for mold. So the key is keeping everything in your home DRY so mold can't grow. 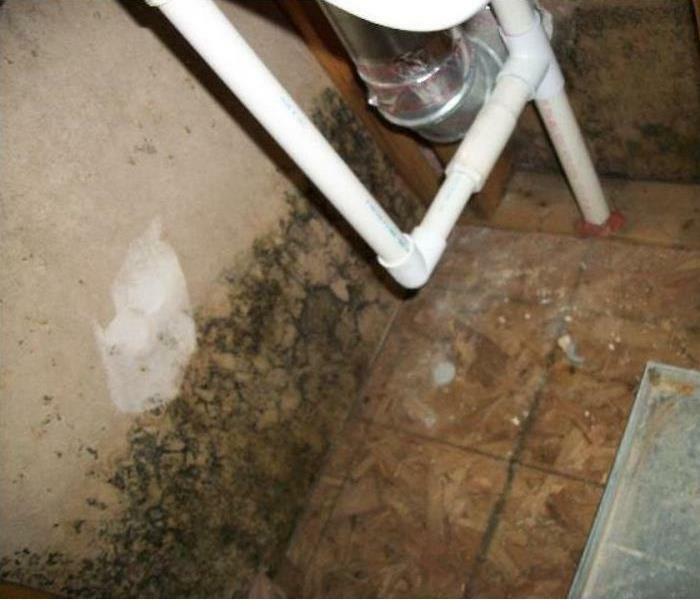 Mold needs moisture to grow. 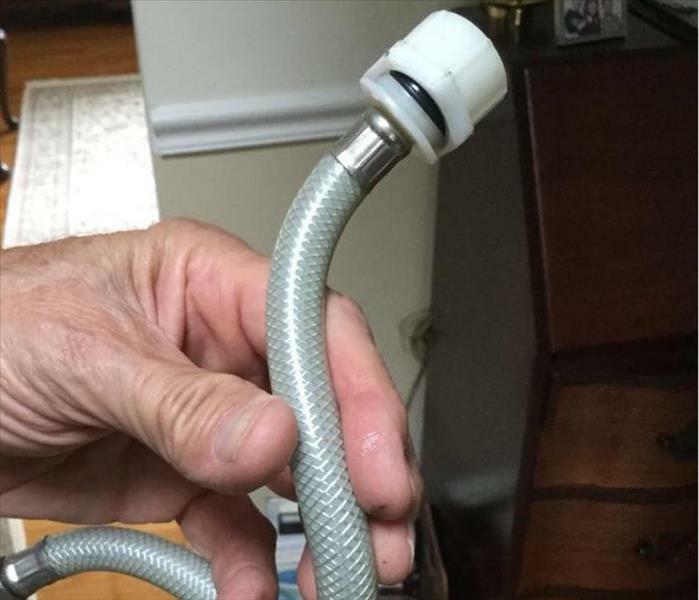 Sometimes it's not moisture from a leaky pipe. 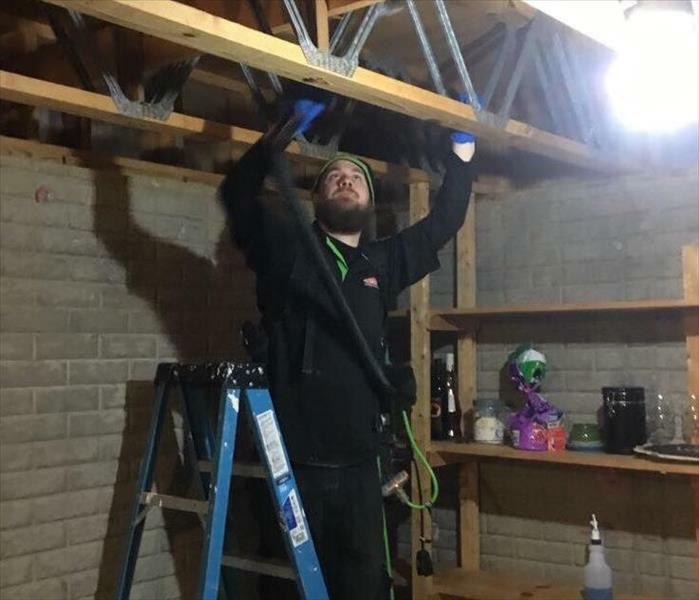 This is a picture of an uninsulated duct above the garage ceiling and over time, the condensation in the hot summer from the cold duct work was enough moisture to start a microbial colony. If you suspect you have a mold problem, call SERVPRO of Burke-Clifton-Fairfax Station at 703-250-6300. Many times, contiguous rooms to the actual fire have enough heat to melt plastic. 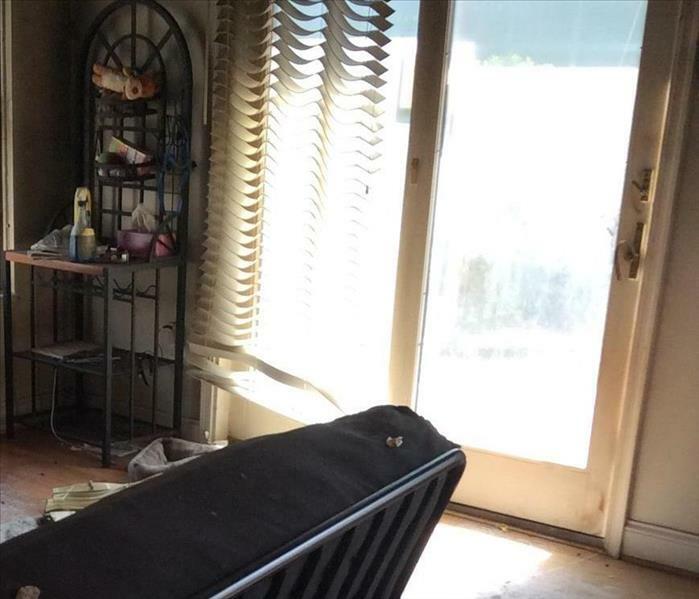 You can see that the blinds, in the familyroom next to the kitchen where the fire occurred, began to melt and became distorted. If you need help with fire damage, call the team at SERVPRO of Burke-Clifton-Fairfax Station. When emergency crews extinguish a fire, it's their job to make sure there is no other threat to the dwelling. Many times they need to inspect other levels and other rooms away from the immediate fire. If you need disaster cleanup, call the professionals at SERVPRO of Burke-Clifton-Fairfax Station at 703-250-6300. Cleaning up after a fire requires a lot of tedious work with specialized equipment to make sure the soot goes out of town. If you find yourself looking for a clean up crew, call SERVPRO of Burke-Clifton-Fairfax Station at 703-250-6300. SERVPRO of Burke-Clifton-Fairfax Station has the equipment and the know how to make sure that the smoke smell is gone after the cleanup. Call us to help with your disaster at 703-250-6300.
Who has the store next door? Many times businesses share walls with neighboring businesses. In this case, a retail phone center was sharing a wall with the kitchen of a next door restaurant. What we thought was a burst pipe if their office turned out to be a flood from the ice machine in the kitchen next door. 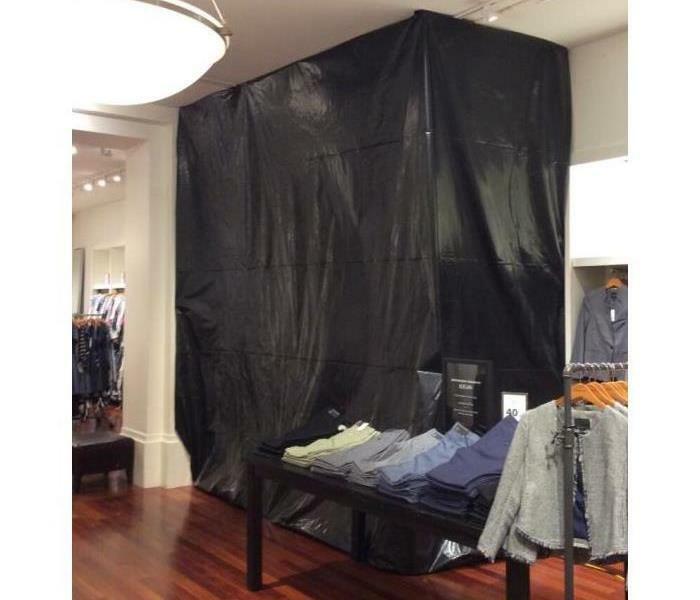 Many times disasters only affect a portion of a retail space. In this instance, it was a leak from the garage over top the store that affected about 100 SF of retail space. We were able to contain the workspace which the store was business as usual. 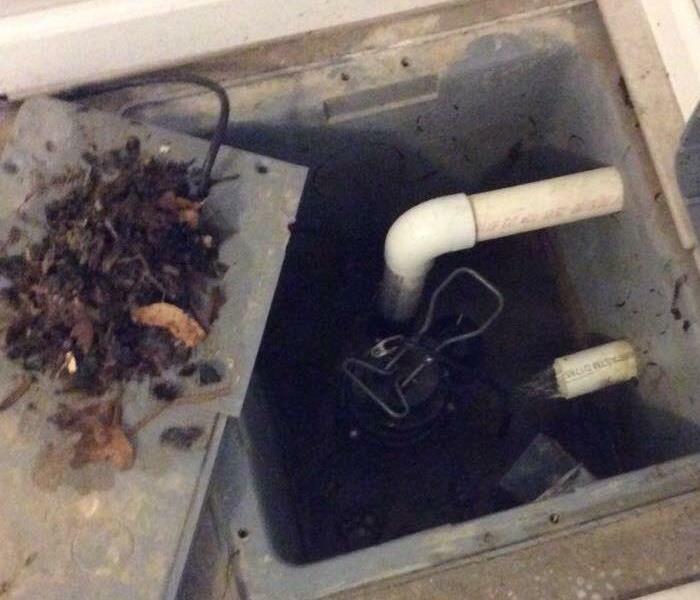 We were recently called out to take a look at an elevator shaft at a building in Fairfax Virginia where a sump pump had failed over time and went unchecked. SERVPRO of Burke-Clifton-Fairfax Station developed and executed a plan that put the elevator shaft back to pre loss condition! When a main line sewer backed up- it hit and flooded the closest drains which were located in this engineering rooms at a commercial building. 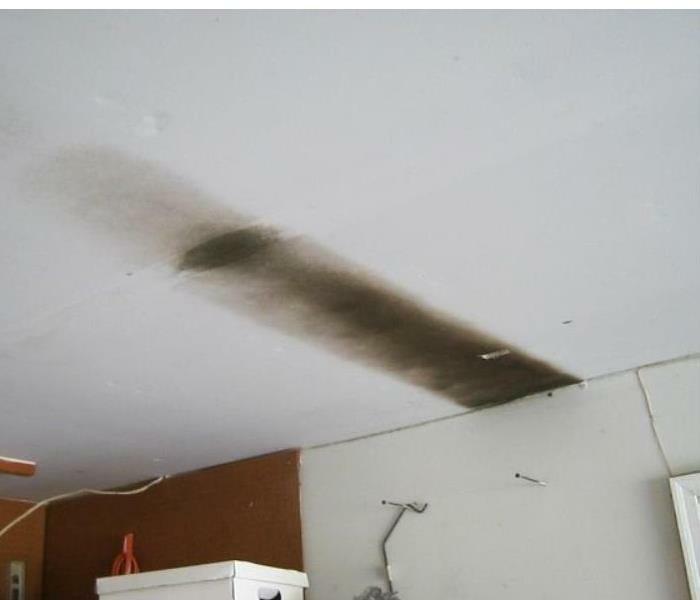 This is the type of specialized disaster that SERVPRO is great at. If you experience a disaster at a property you're responsible for, call SERVPRO of Burke-Clifton-Fairfax Station at 703-250-6300. 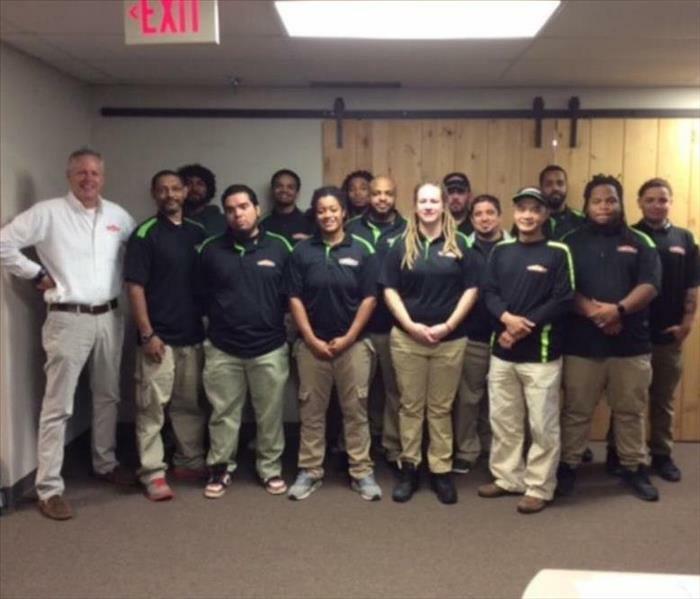 The production team at SERVPRO of Burke-Clifton-Fairfax Station are a group of highly trained and certified technicians that practice respect and care when working to take care of our customers. Call us first when you have an emergency at 703-250-6300. Here's a view of what you can find beneath wallpaper. The glue to the paper has a sucrose that feeds mold. Just add water! Call the SERVPRO of Burke-Clifton-Fairfax Station Team at 703-250-6300 if you experience a mold problem. The SERVPRO Team of Burke-Clifton-Fairfax Station are ready to head out to Fairfax Station to a big job! We are ready and available 24/7 should you need us. Just call 703-250-6300! The SERVPRO of Burke-Clifton-Fairfax Station is getting ready to go to a storm job in Fairfax, Virginia. Our crew is available 24/7 to help you in the event of emergency. Call us first at 703-250-6300. We're Prepared for Your Storm Remediation Needs! SERVPRO of Burke-Clifton-Fairfax Station is always ready for emergencies no matter how big or small. Here is a view of some of our equipment in our warehouse. Should you need us, call 703-250-6300! 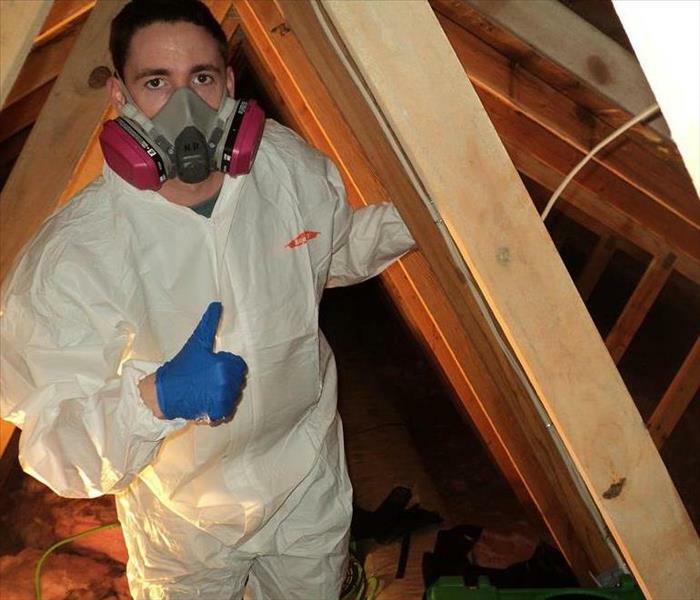 Here is a member of the SERVPRO of Burke-Clifton-Fairfax Station checking an attic in a large house after a roof leak looking for water damage. When disaster strikes, call the SERVPRO team of Burke-Clifton-Fairfax Station at 703-250-6300. SERVPRO of Burke-Clifton-Fairfax Station has offices in Sullyfield Business Park in Chantilly, Virginia. We can reach any part of Fairfax County quickly in the event of an emergency disaster. 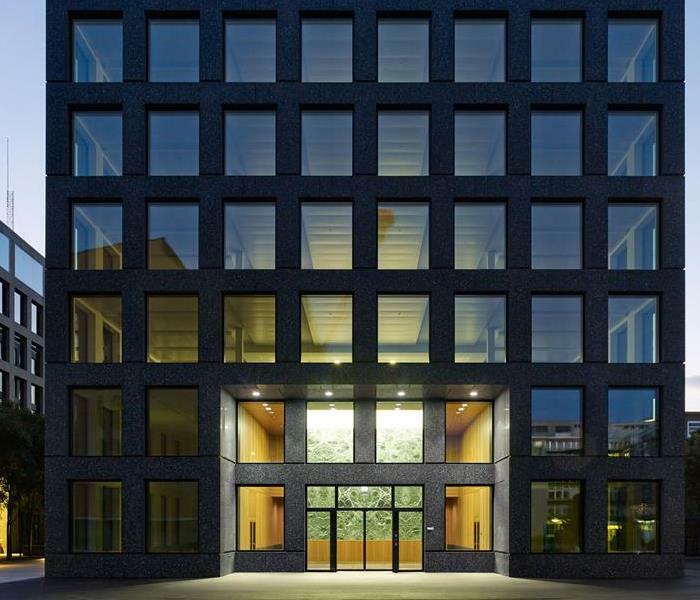 Call our offices at 703-250-6300 any time of the day or night.